FDA Advisers Endorse Genetically Engineered Immunotherapy For Cancer : Shots - Health News An advisory panel to the Food and Drug Administration recommends the agency, for the first time, approve a new kind of treatment that uses genetically modified immune cells to attack cancer cells. Image of a CAR-T cell (reddish) attacking a leukemia cell (green). These CAR-T lymphocytes are used for immunotherapy against cancer (CAR stands for chimeric antigen receptor). After the proliferation of the CAR-expressing T cells, they are transfused back into the patient and can directly detect the cancer cells carrying the antigen. A new kind of cancer treatment that uses genetically engineered cells from a patient's immune system to attack their cancer easily cleared a crucial hurdle Wednesday. A Food and Drug Administration advisory committee unanimously recommended that the agency approve this "living drug" approach for children and young adults who are fighting a common form of leukemia. The agency doesn't have to follow the committee's recommendation but usually does. The treatment takes cells from a patient's body, modifies the genes, and then reinfuses those modified cells back into the person who has cancer. If the agency approves, it would mark the first time the FDA has approved anything considered to be a "gene therapy product." The treatment is part of one of the most important developments in cancer research in decades — finding ways to harness the body's own immune system to fight cancer. And while it has generated much hope, there are some concerns about its safety over the long term — and its cost. Even so, several of the committee members were unusually enthusiastic in explaining their 10-0 vote recommending approval. "This is the most exciting thing I've seen in my lifetime," said Dr. Timothy Cripe, an oncologist at the Nationwide Children's Hospital in Columbus, Ohio. "This is a major advance and is ushering in a new era in treating children," agreed Dr. Malcolm Smith, associate branch chief for pediatric oncology at the National Cancer Institute. For years, scientists have tried to use drugs that stimulate the immune system to fight cancer, and have had only modest success. In recent years, however, scientists developed a new generation of "immunotherapy" drugs that have produced impressive results for a wide range of cancers by unleashing the body's natural defense system. The new treatment is known as CAR-T cell immunotherapy. It works by removing key immune system cells known as T cells from the patient so scientists can genetically modify them to seek out and attack only cancer cells. That's why some scientists refer to this as a "living drug." Doctors then infuse millions of the genetically modified T cells back into the patient's body so they can try to obliterate the cancer cells and hopefully leave healthy tissue unscathed. "It's truly a paradigm shift," said Dr. David Lebwohl, who heads the CAR-T Franchise Global Program at the drug company Novartis, which is seeking the FDA's approval for the treatment. "It represents a new hope for patients." The drug endorsed by the advisory panel is known as CTL019 or tisagenlecleucel. It was developed to treat children and young adults ages 3 to 25 who have relapsed after undergoing standard treatment for B cell acute lymphoblastic leukemia, which is the most common childhood cancer in the United States. While this blood cell cancer can be highly curable, some patients fail to respond to standard treatments; and a significant proportion of patients experience relapses that don't respond to follow-up therapies. "There is a major unmet medical need for treatment options" for these patients, Dr. Stephen Hunger, who helped study at the Children's Hospital of Philadelphia, told the committee. In the main study that the company submitted as evidence in seeking FDA approval, doctors at 25 sites in 11 countries administered the treatment to 88 patients. The patients, ages 3 to 23, had failed standard treatment or experienced relapses and failed to respond to follow-up standard treatment. CTL019 produced remissions in 83 percent of patients, the company told the committee. "This product has been shown to result in a high rate of response," Lebwohl said. Still, while those results are encouraging, the approach has raised concerns. The treatment can produce a life-threatening adverse reaction known as a "cytokine release syndrome," in which the immune system attacks vital organs. In the past, a handful of patients who were getting similar treatments developed by other companies died from serious brain swelling. Although those sorts of complications did occur in some patients receiving CTL019, the patients recovered and there were no fatalities, the company says. There are also concerns about possible long-term complications. 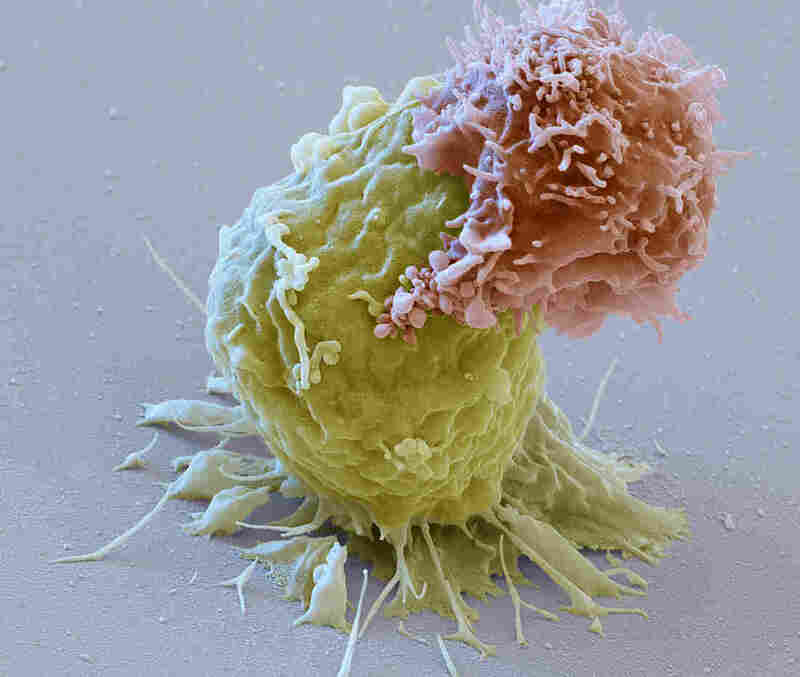 Scientists use a virus to make the genetic changes in the T cells, raising fears about possible long-term side effects. Because of the safety concerns, the company plans to continue to follow the medical progress of patients receiving the treatment. The company is also planning to initially make the treatment available only at about 30 to 35 hospitals that have had the necessary training and expertise to produce and administer the complex treatment. Another big concern is the cost. While Novartis will not estimate the price it will ultimately put on the treatment, some industry analysts project it will cost $500,000 per infusion. Nevertheless, during a public comment period several family members of children who benefited from the treatment in its experimental phase have made emotional appeals to the committee to recommend approval. "I'm happy most of all for the patients who will benefit from this therapy," said Dr. Carl June of the University of Pennsylvania Perelman School of Medicine, who developed the therapy.